Traditionally, beanbag chairs were designed for kids, but that’s not the case anymore. More and more companies are making beanbag chairs for adults who are young at heart as well, and Sumo Lounge is one company that specializes in this area. I recently had the chance to try out their Sumo Sway Couple beanbag chair and write a review for it, and it is quite comfortable. I received the Sway Couple in khaki micro-suede from the kind folks at Sumo Lounge, and I was pleasantly surprised. 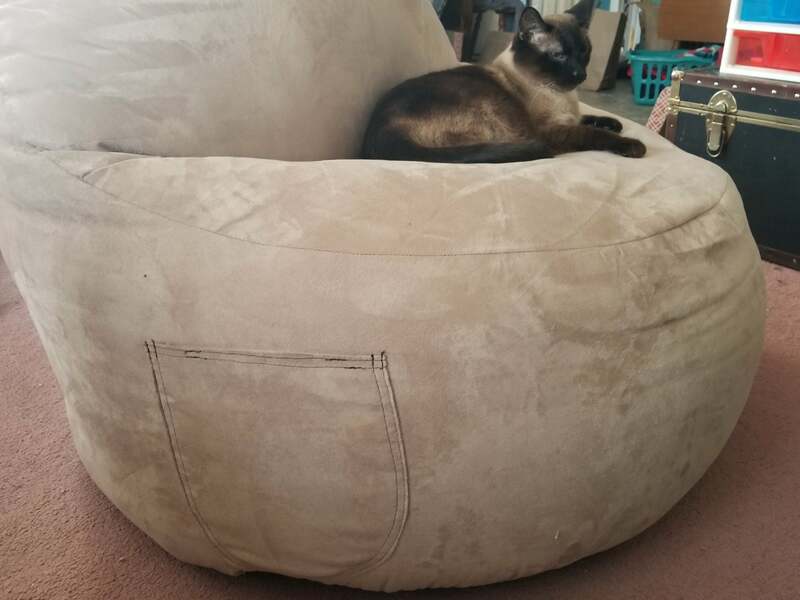 The beanbag chair seems to be stuffed quite full, so it isn’t the sort of squishy, shapeless blob one would normally think of when it comes to beanbag chairs. In fact, the Sumo Sway Couple beanbag chair is nicely shaped with a soft seat and formed back. The chair is marketed as fitting two adults, but unless you’re both quite small, I think it might be a bit of a squeeze. However, its larger size means that it’s quite roomy for one person, even one adult. I’m very tall, so when I sit in the chair, my neck does stick up pretty far above the back. For the average person, this would probably be fine, but I have a spine condition which calls for taller backs on my chairs. My son is 11, however, and the Sumo Sway Couple is the ultimate beanbag chair for him. He’s pretty tall for his age, and I can imagine that this is one chair he will enjoy for many years. 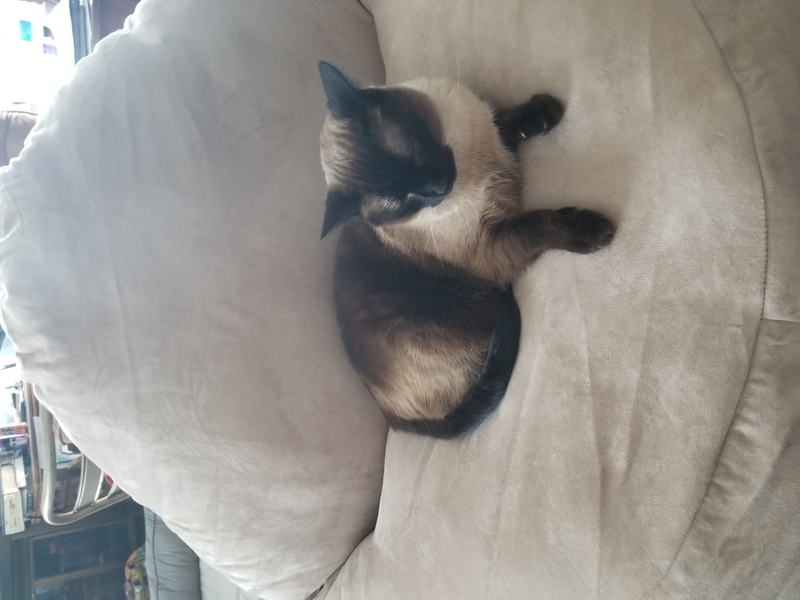 He pretty much monopolizes it all day when he’s home, sitting in it to play video games or watch TV. 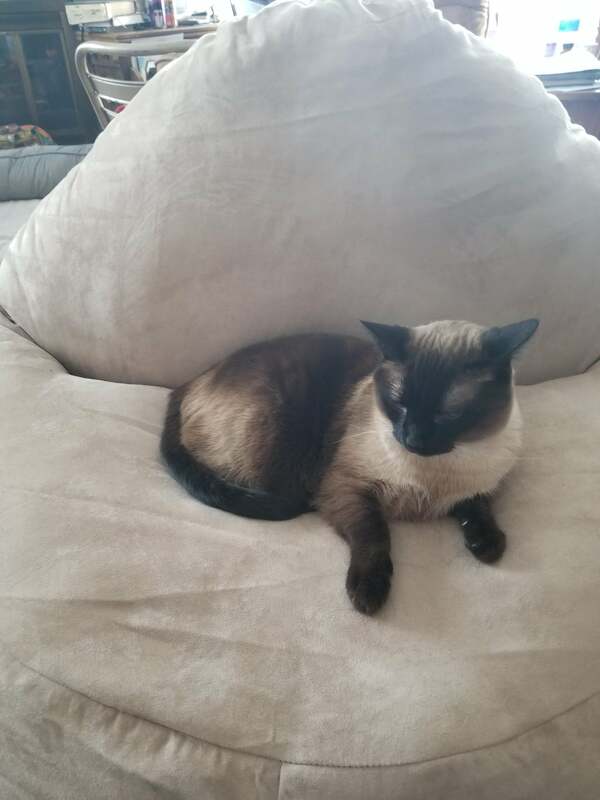 When he’s not sitting in it, his cat usually is (if he’s not demanding food, that is). When I do get the opportunity to sit in it, I find it quite comfortable and soft but with some level of support. Because of my height, I tend to use my ottoman with it to put my legs up. Because the bag seems to be stuffed very full, it is closer to being a real chair than most beanbag chairs are. The fact that it has a back on it makes it even more like a real chair. It is still a beanbag chair, but I’d say it probably comes as close to a real chair as a beanbag possibly could. The Sumo Sway Couple is surprisingly supportive for a beanbag chair, and they’ve really paid attention to detail in designing it. There’s even a large pocket on the side where you can tuck the TV remote, a water bottle, or whatever else you want to keep safe and tucked away. The micro-suede material is very soft and comfortable, and the khaki is a nice color. It is on the lighter side though, so it’s good to keep that in mind if you have pets and/or small children. Disclosure: I did receive a Sumo Sway Couple beanbag chair to complete this honest review of the product. No other compensation was received.